It's simple, has 5 attributes, two of which are String and other two are numeric. One attribute, lastScore is a JSON array. The good thing about Gson is that its feature rich and comes from Google, which is known for performance. Btw, if you are not very familiar with JSON format itself, I would suggest reading Beginning JSON by Ben Smit to learn more. It's a must that you know some basics of JSON before encoding and decoding Java objects to JSON. The JSON-Simple is another open source library which supports JSON parsing and formatting. The good thing about this library is its small size, which is perfect for memory constraint environments like J2ME and Android. The good thing about json-simple is that it is also JDK 1.2 compatible, which means you can use it on a legacy project which is not yet in Java 5. One of the drawbacks of Jackson is that it requires JDK 1.5 so if you are stuck in earlier Java version than it may not fit there. Also, Jackson doesn't support J2ME, but one of the main advantages of using Jackson is that it supports streaming which can be used to parse huge JSON response without loading it fully in memory. 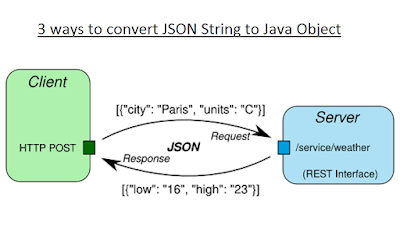 You can read more about how to parse JSON String to Java object using these libraries on Developing RESTful Services with JSON, one of the good books which explain how to use consume JSON data from web services. That's all about how to convert String to JSON object in Java. You can use any of the json-simple, Gson or Jackson for parsing JSON messages received from web services, each of them has their own advantage. Json-simple has small memory footprint means it's quite suitable for J2ME and Android client, while Jackson is feature rich so better supported for a large project. Gson is in between them and my favorite general purpose JSON parser in Java programs. Where is Player class? It would be clear if you could show/comment that. Thanks. Player is a Bean/Pojo class containing Java Objects based on which JSON to JavaObjects [and vice versa] takes place. This class will contain all the headers/root objects for your JSON. What if you don't want to convert to a class (e.g. Player) but just want it in a JSON format to be able to parse parts of it? What's the Player class all about? how to get JSONObject value to string object and that value how to set on setter value to db. How to create interface to convert string to Json()? i have a interesting Jason String and i coud not to pars it because looks different. i just need to take a Status and message as Object can somebody help me? Just like shown here, in JSP you can put Jackson or Gson library in the WEB-INF/lib and then write code in scriptlet but better if you do this conversion in Servlet as JSP is just meant for displaying data not generating. I am new to JAVA, i have a String which has a JSON in it. I am trying to create a JSON object. I cannot understand the Players here and how i can use that inorder for me to create JSON object. Since Java EE 8 (2017) JSON should be processed by JSON-B 1.0 and JSON-P 1.1. Yasson is the reference implementation. Jackson, Gson etc. are subsumed in this standard and they contributed to it. Hello Aishwarya, you need to use json-simple-1.1.1.jar to use JSONParser and JSONObject, you can download the JAR file from Maven repository https://mvnrepository.com/artifact/com.googlecode.json-simple/json-simple/1.1.1. If you are using Maven, Gradle or Ivy then you can also include it as dependency.